Our volunteers information meeting for 2019 will be on Tuesday 15th October 2019 at 7pm at Queens Road Baptist Church - please check back for further details. PROVIDING SHELTER AND COMPANY TO THE HOMELESS AND LONELY AT CHRISTMAS. 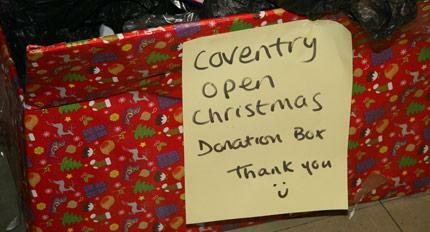 Coventry Open Christmas is a voluntary organisation managed by the "Grub & Gab club". We provide shelter and food to the homeless and lonely over the Christmas holiday. The shelter is held at Queens Road Baptist Church. We have been helping the homeless and lonely and we hope to make it really special. We are looking for volunteers and donations, if you would like to help please get in touch. We will again be open for 24 hours a day across Christmas week. This is a great benefit to our visitors, especially given the low temperatures of the last few winters. As you may appreciate, this requires extra resources to make this happen; primarily we need additional volunteers but also donations of cash, food, bedding and clothes. If you, or anyone you know, would like to help us to make a difference this Christmas then please contact us. Following the success of the 2018 shelter we will again be open for 24 hours a day across Christmas week. This is a great benefit to our visitors, especially given the low temperatures of the last few winters. As you may appreciate, this requires extra resources to make this happen; primarily we need additional volunteers but also donations of cash, food, bedding and clothes. If you, or anyone you know, would like to help us to make a difference this Christmas then please contact us. Email the website designer here.